The things that begin with n on this worksheet are not naughty, but nice. See for yourself. 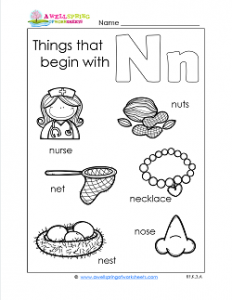 They are: nurse, nuts, net, nest, necklace, and nose. Take a few minutes to read the words to your kids, demonstrating the same beginning sound. Have them make the same sound. Have them “read” the words with you, then circle the n at the beginning of each word. Then they can color the pictures and the letters. Have them say the words as they’re coloring for even more letter n practice!